Albion goalkeeper Mathew Ryan says the club pride themselves on being hard to beat after coming from behind twice to draw with Stoke on Monday evening. 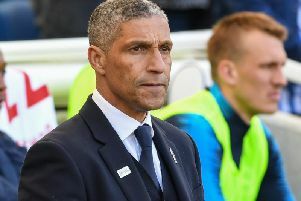 The Seagulls are ninth in the Premier League after 12 games, with 16 points, but have had to fight back to draw their last two games at the Amex. They trailed to Southampton before drawing 1-1 last month and were behind twice against Stoke before hitting back to claim a 2-2 draw. On fighting back to earn valuable points, Ryan said: "Not everything goes to plan all the time so when the team has the ability to do that it speaks volumes about the character and the personalities you have in the team. “We pride ourselves on never being an easy opposition to play. If someone’s going to come out and beat us, they really have to be on their game." Looking back on the draw with Stoke, Ryan said: "I reckon we could have got more. Defensively we were poor in the first half - the goals they scored didn't surprise us. "They didn't do something we didn't already know - with Shaqiri picking up the ball and looking for those killer passes in behind and we know they have good delivery from set-pieces as well. "We've got to learn from getting back on level terms and then going behind straight away again but I think the positive thing again is our character to come back and get something after going behind twice. "It wasn't our best 45 minutes but in the second half we were back to what we had showed before the international break."